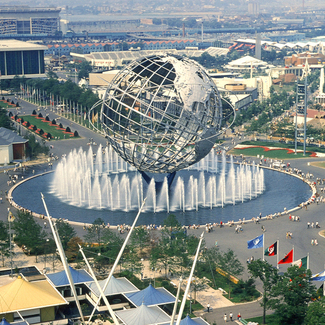 This month marks the 50th anniversary of the 1964 World’s Fair in New York. Some people know it because they attended, some know it as the origin of the most loved/hated ride in all Disney parks, and some know it only from a mention by They Might Be Giants. However you know it, the New York World’s Fair was an impressive event. I know, the World's Fair isn't Apple related, and normally I'd have made this a Cool Stuff Found entry here at TMO; but, when I went to write it up I had so many cool things I decided to make it an editorial. Sadly what remains on site is minimal and only some is being maintained at all, but luckily the internet has come to the rescue. Curbed has a nice feature on the architecture which includes amazing photos from the fair, and Mashable has some photos from inside some pavilions. There’s a nice “Then and Now” post at Imagineering Disney from last year which shows the site currently and compares it to the fair, and if you want to dig into the details, head to the NYWF64 site which has photos, stories, and clickable maps of “The Fairgrounds,” officially named Flushing Meadows-Corona Park. Get a tour of the fair in the video below. There's more information about World's Fairs (called "World Expos") on the site for the Bureau of International Expositions, and it may surprise you to know they're still happening, with the next one slated to happen just over a year from now in Milan.